I finally visited this small area (houses around Tuisu street) after having had a hunch that there may be something interesting. There really was. So yet another hidden corner discovered and explored. I walked around about 20:40-21:10 (unless my camera was 1 hour off in either direction) so sun was already getting down too much and shadows are too prevalent in many photos. This is roughly the brightest time of the year. Looks totally unique to me. Isn't that beautiful? 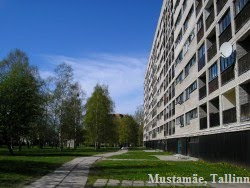 There are similar blocks in Võru, one in Põlva, and certainly in many other cities too. Parking house of Tammsare way 49 office building. My old map shows this area mainly empty. Tammsaare way 49 from backside. Photos of the construction of this are in post nr. 417.